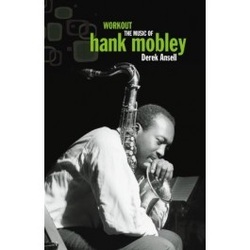 Tenor saxophonist Hank Mobley is in danger of becoming a somewhat shadowy figure in the history of jazz. Underrated in his lifetime, and underappreciated since, his achievements if it were not for this book may continue to go unrecognised. Born in 1930, by the time Mobley had begun his professional career he initially appeared to be just another tenor player overshadowed by the acknowledged giants of the instrument, firstly by Sonny Rollins and latterly by John Coltrane. With all pervasive influence of both of these men on the tenor stylings of the fifties and sixties, Hank sounded like neither of them. Whether this was to his advantage or detriment is the subject of this book. Derek Ansell argues that not only was Mobley unjustly overlooked in his lifetime, but can also be considered an unsung hero of the music. Ansell states his case well and with a logic that is hard to refute. Very early on in his career Mobley appeared to arrive on the scene more or less fully formed as a musician. He had an original tone on the tenor saxophone that was not immediately attributable to any single influence, and a rhythmic flexibility that allowed his phrases to flow freely and unpredictably, bringing a tension and release to his music that was quite unique. Ansell steadily states his reasoning for Mobley’s promotion to the highest echelons of the jazz hierarchy with references to the saxophonist’s prolific recorded output as a sideman with Horace Silver and Art Blakey in the original Jazz Messengers, as a frequent sideman on Blue Note Records, and of course the albums made under his own name. The author states his case for the saxophonist with an analysis of his many recording and musical associations, and always at pains to point out how the resulting music differed from that of his contemporaries. In the course of this discourse there is at time some repetition with some albums being discussed or referenced back to in several different chapters. In fairness, Ansell can do little other than discuss the music as Mobley was a very private individual and not much is known about his personal life away from music. He gave only a handful of interviews in lifetime, and none of his known associates that are still available for comment could shed any further light on the saxophonist’s sometime tumultuous private life. It is therefore on the music alone that Mobley’s importance can be judged, and if this book does no more than refer us back to the albums then it has done it’s job.